There are thousands of predatory mites in North America and they belong to several different arachnid families. The most important family is Phytoseiidae and the mites belonging to this family are known as phytosiid mites. They are common in the landscape and garden primarily eating pest mites such as the spider mite. Some of the phytosiid mites are specialist predators eating only one type of pest mite, while others feed on more than one species of mite depending on the abundance of the food supply. Still others are generalist predators and consume a variety of mite species as well as insects like thrips, whitefly nymphs, scale crawlers, leafhoppers, fungus gnats, and psyllids. These mites can survive on pollen when their preferred food is no longer available. Phytosiid mites are pear-shaped, wingless, eight legged, shiny, and translucent to reddish orange depending on the color of their most recent food supply. They can be distinguished from their pest mite cousins by their longer legs, slightly larger bodies, and their tendency to move around rather than being sedentary. In addition, their eggs are larger and more egg shaped than those of the pest mites. The life cycle of phytosiid mites can be as short as three weeks so the mites can produce multiple generations in a single year. Females lay their translucent white oval eggs singly on the bottom sides of leaves next to a vein. The larvae that emerge in two to three days are tiny, oval, translucent shiny white to tan and have three pairs of legs and no wings. They feed for a couple of days, molt twice to become nymphs with four pairs of legs and no wings, and then become wingless, four-legged adults. In order to attract and maintain phytosiid mites cover and food must be provided. A diverse selection of native plant material will provide both for the largest number and greatest variety of phytosiid mites. When using these mites to control an infestation of pest mites, spray the infected area with horticultural oil in early spring before the flowers open. This will hurt the pest mites early in the season before the predatory mites emerge from their protected over-wintering sites. 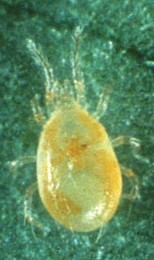 Predatory mites are commercially available. To buy predatory mites from Amazon.com click here.